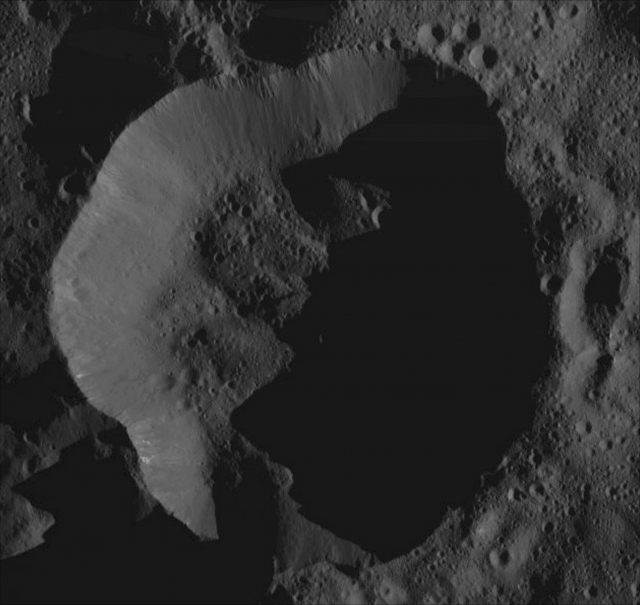 This is an Extra Detail Magnification (or "EDM", for short) obtained from the fascinating Contextual Image (or "CTX Frame", for short) of the Dwarf Planet 1-Ceres, taken by the NASA - Dawn Spacecraft on February, 12th, 2016, which shows us an ancient Unnamed Impact Crater and long Shadows which cast a "dark mood" on the whole scene, located near this magnificent Dwarf Planet's North Pole. Even in this case, some white Striations (whose origin is still unknown) can be - just barely - seen on the East-facing Inner Slopes of the Crater. The Original View was centered at approximately 78� North Latitude and 5� East Longitude. The NASA - Dawn Spacecraft captured the scene during its Low-Altitude Mapping Orbit (or "LAMO", for short), from an approx. altitude of 240 miles (such as about 386,2416 Km) above the Surface of 1-Ceres. The Image Resolution is roughly 120 feet (i.e. about 36,576 meters) per pixel (---> Picture Element).